The same? Similar? Different? Why or why not?" I asked the question because these things have been on my mind a lot lately. It's been something I've been mulling over quite a bit. When Dan and I bought our homestead almost five years ago, we had a strong conviction that this was something we must do. We had some skills and some experience, but it's been a journey nonetheless. Our first five years were spent observing, planning, prioritizing, researching, building, fixing, experimenting, and learning. 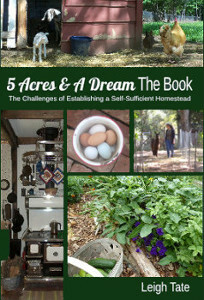 These years were the basis for my book, 5 Acres & A Dream The Book: The Challenges of Establishing a Self-Sufficient Homestead. In the book I referred to these first years as our "establishment phase." Each chapter addresses a different aspect of self-sufficiency and the learning curves we've faced for each one. Our biggest challenge, however, has not been something tangible such as learning how to grow and preserve a year's worth of food, or how to get off-grid. Our biggest challenge has been our own mindset, or world view. "By this I mean one's expectations about how things ought to be, about life and society as we are used to them. It's our attitude, particularly about what we have, what we need, and how we get it. It's our mental image about cultural and lifestyle standards, of how life ought to be lived, how things ought to work" Chapter 10, "Obstacles"
This was the focus of Chapter 10, "Obstacles," and is the topic of a number of my blog posts (see list of related posts at the end). This is the topic that is foremost in my mind now. Why? Because now that the master plan is fairly set, the house has received many repairs and lifestyle improvements, and proper outbuildings are in progress, it's time to think beyond getting established. It's time to draw on what we've learned and put it all together. Hence this research question, for which I turned to you. As my homesteading cyber-community, your feedback not only helps me clarify my own thoughts, but as a writer, I need to know what you think if I'm going to engage you on an intelligent level in my writing. I will blog about it every step of the way and, perhaps, this may become the basis for a sequel to 5 Acres & A Dream The Book. It does seem true that there is more written about permaculture than agrarianism. I'm sure many know that the term permaculture first came in to use in 1978 from, "permanent agriculture". Most simply defined, it is a design system for sustainable agriculture based on natural cycles and ecosystems. Popularly, it is used as a landscaping system in both rural and urban areas. Over the years the meaning has expanded to "permanent culture", with the hopes that it can solve many of the world's social problems. Agrarianism is a rather ancient concept, and hence possibly more obscured in meaning over time. Because of that it is difficult to find a definition which describes it as modern day agrarians think of it. It is often thought of as agricultural, but agriculture can take many forms, from the single family subsistence farm to the multi-billion dollar industrial farm. Personally, I would define agrarianism as a cultural, economic, and social system based on the land, on agriculture. To further clarify, the opposite of agrarianism is not urbanism, but rather industrialism, which is based solely on money and its byproducts - consumerism and commercialism. Historically agrarianism was community based and encompassed all manner of trades and occupations. The difference was that these communities were based on a dependence on the land, rather than a dependence on money (either "real" or otherwise). So I agree with you all that permaculture and agrarianism are not the same thing: one is a design system, the other is a cultural, economic, and social model. That does not imply incompatibility, and many agrarians do indeed practice permaculture. A permaculturist, on the other hand, may or may not be an agrarian. The CEO of a large investment firm, for example, can have an extensive permaculture landscape, but could not, as such, be an agrarian. Is agrarianism really so arrogant as to assume superiority over any other model? How one answers that is going to depend on where one's sense of security lies. The heart of the modern agrarian movement does not see the industrial economic and social model as sustainable. It is seen as self-consuming and doomed to fail. The call for change is an attempt to extend a lifeline to anyone who wishes to grab on, before it's too late. Those are my beginning thoughts on it, as we work toward creating a sustainable homestead. I do have more to ponder out loud and will blog about it from time to time. Please do continue the conversation with your comments. And below are a few related posts if you are interested. "Good and Bad Investments For Farmers"
Agrarianism: Forward or Backward Thinking"
To answer my own question where permaculture and agrarianism cross over, which I raised in the last post (and you discussed here); I think both reject industrialism as a basis for community security. The main definition for permaculture, is "permanent agriculture", but one of the co-inventors of permaculture, Bill Molison, likened it more to Permanent Culture. In other words, he saw its potential to build human cultural systems, which could engage in the kind of permanency levels, forests do. How old can a tree live when not cut down, and how many organisms does it help sustain in that incredibly long life-cycle? Those very questions helped Molison (and his student David Holgrem) put together the 12 permaculture principles, to help design human systems of renewal, not just consumption. I don't know much about agrarianism, so I ask if they pose that kind of permanency in their systems - be that political, social or agricultural? I'm not suggesting they don't, I'm suggesting I don't know much about agrarianism, lol. In Australia we have industrial agriculture, and those farmers are held under the thumb of capitalist markets. What they grow and can ultimately be paid for, is driven by mass production. There is also a growing movement of organic farmers who attempt to break away from the industrial mass production model. They try to do what's right by the land, and not just do what is demanded at the cheapest possible price. Unfortunately, the law governed by State, Local and National levels, tend to favour the industrial model, to the expense of those trying to go the other way. I think where permaculture succeeded, was getting people to practice growing stuff at home, no matter where they lived. It then got people demanding organic produce more, and chasing down their local farmers for supply. In effect, it financially empowered the small organic producer to produce more, in an industrial economic model which worked against them. Do agrarian systems, capture the business they need to sustain themselves, in a capitalistic dominated world. That's my main interest in this discussion, and something I personally experience as a small land holder. It's maintaining the balance of how much is required between outside income, and what can be raised (or offset) on site. 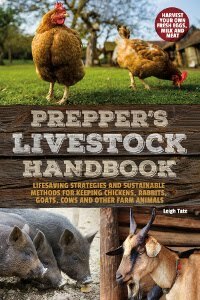 I like permaculture and agrarianism for their ability to teach a way of living different to the industrial model, but we still (unfortunately) have live with the dying beast in the meantime. How do we maintain those permaculture/agrarian beliefs funded, in a capitalist environment? So much to think about. I am looking forward to the posts to see where this leads you. I am also going through your older posts to see where I can glean from your excellent advice now that I am actually IN the establishment stage. I can't wait to get your book when taxes come in! I have to say your Australian model is as it is here. Probably our best examples of successful community based agrarianism are community sustained agriculture (CSAs). Also farmers markets. I do think there are more folks would would like these kinds of options than agribusiness cares to admit. Stephanie, I so hope they are an encouragement to you. I think your beginning steps in establishing your homestead have been wonderful. And stand by for another giveaway to celebrate an anticipated 500 copies sold; I'm only a few away! Right then ! Where to start? I would love to think that I could add an intelligent comment to this discussion, but sadly not! I held back from commenting on your first post, hoping that others' definitive comments might in some way help me to find the words to describe my own. What I thought were relatively straightforward ideals have now morphed into something I am struggling to recognise and I suspect I am over-thinking this. I will continue to read your posts with interest and hopefully contribute some coherent thought soon. On a lighter note, I received an Amazon voucher as a gift today. I'm off to order your book Hurrah! Maybe I'm retarded and a little slow on the uptake, but I always assumed that permaculture was a agrarian practice, hence a small component of agrarianism. I define "agrarianism" as the marriage of people to their land and to their community. First I'd like to share a link to an article by Wendell Berry, The Agrarian Standard. I think he eloquently hits the nail on the head. Gill, I'm delighted you're going to get my book! I do hope it is an encouragement to you. And I hope you'll consider writing a review after you read it. I think your thoughts are likely similar to many others. These are concepts that I'm not sure have been well defined in the minds of many. That's why I decided to write about it and ask the opinions of others. I think the conversation will help us all. Katherine, I don't think you're entirely wrong about your assumption of agrarianism and permaculture. And I love your definition of agrarianism. I don't think it's another word for permaculture, but I do believe they are compatible. I just hope I haven't presented my question as an either-or. Diane, thank you so much for the comment and the link! What an interesting sounding book. I love that it was written in 1940. I definitely need to take some time to read it. This is a fascinating subject to me. And The Winner Is . . . . . . . .
Well Ladies, Who's Gonna Be First? Giveaway: Celebrating Over 500 Copies Sold!